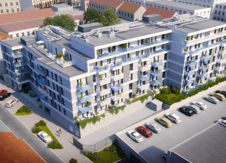 The apartment building, SMART LIVING KLR@Plzeň, is set in Kollárova street which is less than 500m from the Great Synagogue, one of the prominent landmarks in the city of Plzeň. The biggest Plzeň shopping and entertainment centre, Plzeň Plaza, is located even closer. The positively premium location of the project is one of the greatest benefits of the first Trigema Smart Living projects outside of Prague. In a six-storey house, there are 82 new apartments of various categories. Another advantage is that each apartment is equipped with a balcony, loggia or terrace. Apartments on the top floors then have generous roof terraces. Thanks to the well-thought-out concept, Trigema Smart Living offers a number of benefits that will be appreciated by those who are looking for contented living. In a house with a decently bright facade and elegant grey details, emphasis is placed on energy economy and other characteristics that Smart Living brings – triple glazing, a brick wall system and, above all, a comprehensively designed residential layout. Trigema a.s. holding, which has operated for 23 years, since 1994, implements the KLR project through subsidiaries. 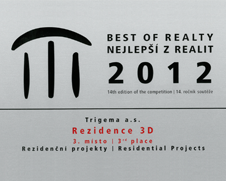 Trigema has already completed a number of successful residential projects in Prague-Radotín, Jinonice, Stodůlky, Hostivař, Modřany, Roztoky u Prahy and in Letňany. These projects have involved the construction of twenty apartment building containing over 1 300 new apartments. Besides residential construction, Trigema has also been involved in other developments. In 2006, we opened the Academic hotel and congress centre in Roztoky u Prahy. We have also completed the Monínec modern recreation centre project.. In summer 2011, we completed construction of the STP Roztoky. (a science and technology park with business incubator and transfer technology centre – a new centre for research and development for startup or established companies mainly in the automotive industry, but also for researchers and developers from the Czech Technical University’s Mechanical Engineering Faculty), with construction of the similarSP Roztoky. project completed in 2014. 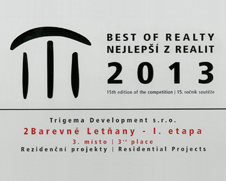 Trigema’s last completed residential project is 2Barevné Letňany. Here our modular living concept was first successfully introduced, something we are developing further in out SMART project. 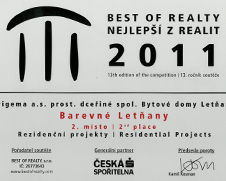 The 2Barevné Letňany project also won awards in the Best of Realty and Real Estate Project of the Year competitions. Our company has also received awards in the competitions Industrial Property of the Year, Building of the Year and also Tour Region Film for its advertising spot for the above detailed Monínec centre. The sole vendor of the BLV apartments is Trigema Development s.r.o. Construction is contracted to Trigema Building a.s. The architectural design was produced in the studio of (Ateliér Daniel Smitka studio). (Ing. Arch. Daniel Smitka). All producers and vendors naturally endeavour to offer the best all round product for the best price. All such efforts have their limits, and as such we hereby summarise for you the principles we are guided by in every project, which we won’t cut corners on. In planning each of our projects, we endeavour to think of the future and design our buildings so they serve their purpose in the long term and do not unnecessarily burden their surroundings or the environment. As such, in selecting a location and planning a project we take a look at the surroundings and current buildings and endeavour to ensure our project further develops the neighbourhood’s planning concept. Sustainability naturally also involves materials and quality workmanship. In all our projects, we endeavour to achieve the maximum energy efficiency, mainly through choosing appropriate materials and ensuring careful workmanship. This means we save our residents money in energy costs and reduce the burden on the environment. We insulate wisely to ensure we achieve the best results without excessively increasing the construction budget – we don’t put forward any objectives we want to achieve at any price; we simply want to save your money and the environment where we can. We place high demands on the materials we use in construction, and careful workmanship in construction. Just as poor-quality bricks can devalue an otherwise good project, so poorly implemented construction work means the building loses the benefits of the high quality materials used. We are just as uncompromising on our suppliers as we are on our own workers, in order that we can offer you products and services of the highest quality. Our goal is to offer you a high quality smart home or other services at a good, and especially fair price. As such, we do not add any discounts or other special offers for selected clients to our final prices. The prices detailed on our website are final, and in contrast to some of our competitors, we do not overstate them in order to provide apparently generous discounts on them. We apply a similar approach to our suppliers. We do not look for the lowest price, but rather value for money. Nor do we exploit the tradespeople on our construction sites, cheating them out of their well earned money. In the same way, we have no place for favouritism, protectionism and bribery, and we say goodbye forever to any supplier that attempts to buy a job from us. We won’t take part in a race to the bottom or a price war, we don’t try to destroy our rivals – we offer a fair price for products and services we believe in and we endeavour to do this honestly. Do you want to know more about what we take pride in, and what we consider poor practice? You can find our opinions on accommodation and Prague’s real estate market, along with regular analyses of the residential market in our blog. Trigema operates in the capital city of Prague and in the outlying regions. In 2017, the first project in the Smart Living standard, Premium CSV@Řepy was completed and just a month after approval, the CLB@Letňany project was successfully sold. In the autumn, the BLV@Horní Měcholupy project in the Smart Living plus standard was also completed. In 2016, the scope of the Trigema Smart Living concepts spread throughout Prague and entered the outlying regions. In Prague, you can find a project in Nové Butovice, where the first stage of SMART Apartments was completed in autumn 2015 and stage II. later in the summer of 2016. In the autumn of 2015, the BLV@Horní Měcholupy project was launched, and CLB@Letňany in winter 2015. Among the newer projects on the market include self-contained JRM@Lužiny. There are new projects at different stages of preparation with over than 2500 flats. Historically, the company has completed more than 1,600 apartments throughout the whole of Prague. Prague 15 is changing for the better. Further proof of this is the transformation of the current heating plant, which lies near Bolevecká street to a place full of life and greenery. While in the past the heating plant was a blot on the landscape to all those who lived here, the whole area will be transformed beyond recognition. SMART LIVING BLV@Horní Měcholupy comprises a new apartment building in a slick orange and grey exterior based on Trigema’s Smart Living concept. Last several flats in sale, will be completed during autumn / winter 2017. SMART – it’s not just fittings for smart living technology; it’s an active life within reach of the centre yet a few metres from green spaces. Save your time and energy for heating and running your home. Our new apartments are just a few metres from Nové Butovice metro station, are at low-energy standard and will satisfy anyone who appreciates smart solutions. SMART – it’s the environment, green spaces, amenities, a quarter of an hour to the centre and a maximum of 45 minutes to anywhere in Prague. Don’t stay behind; be SMART. This apartment building on Chlebovická street builds on the popular Barevné Letňany project, which comprises a Red, Yellow and Blue building. The site will contain 75 new apartments with carefully designed layouts whose nature can satisfy a wide spectrum of clients. Most apartments come with a balcony or terrace. The upper storeys contain mainly large maisonettes. The small-scale CSV@Řepy project perfectly illustrates the essence of the Smart Living concept. A modest building to grow up in a quiet villa neighbourhood in place of the current dilapidated building. 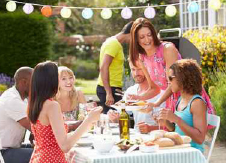 You can experience a very peaceful atmosphere just a few minutes from the buzzing metropolis. A rural style of life dominates Čistovická street. In place of the current dilapidated and unused building, a five-storey residential project will rise up with 21 apartments and a further three non-residential premises. CSV@Ŕepy best characterizes the idea behind Trigema’s Smart Living concept: it will be a modest building which will develop its immediate neighbourhood; the number of apartments marks the socially richer nature of the accommodation, and its standards ensure a high quality of living. The architecture of the project SMART LIVING KLR@Plzeňen comes from the pen of architectural office AIP Plzeň. Plzeň company, AIP Plzeň spol.s r.o., was founded in 1992 and then continued to work on the project centre of architectural design "A" Stavoprojektu Plzeň, which, in the previous year, was transformed into the state enterprise "ATELIER A PLZEŇ". Ing. arch. Jan Baxa collaborated with the design department Trigema Building a.s.